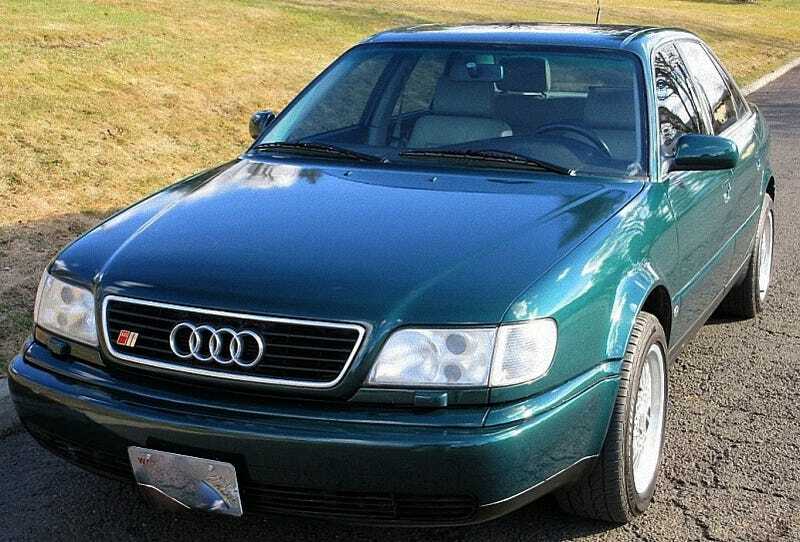 Unlike the supposed unintended acceleration Audis were accused of in the ‘80s, the get up and go of today’s Nice Price or Crack Pipe S6 Quattro is fully intended. Let’s see if its price has you intentionally racing to, or away from it. Passivity is never an attractive attribute, especially as an automaker. That’s perhaps why yesterday’s 2000 Mitsubishi Montero ‘Endeavor’ came up short with a 54% Crack Pipe loss. Hell, Mitsubishi’s been endeavoring to sell cars here for the past decade without a whole lot of success so maybe that special package name is appropriate for the whole brand! Audi has had its share of troubled names over the course of its existence. Their first big model here in the States was the 100LS. That car suffered a rep for poor quality so when Audi replaced it they also replaced the name, calling the new car here the 5000. The 5000 also got a bad rap so when it was replaced the company switched the name back to 100 (and 200 for the fancy ones) thinking no one would be the wiser. Oh but we knew, Audi. You can’t fool us. Of course, eventually Audi changed their entire naming convention to an alphanumeric A and size class number - A3, A4, etc. The former 100 became the A6 and the higher-performance 200s became the S6, the S denoting sport, or a sinewy curve in the road if you’re really visual person. Here we have an example of the S6, a name that has gained a reputation for alluring executive transport, and here it comes with a five-speed stick to ensure that its driver is a doer and not just a delegator. I hate delegators, and alligators. This 1995 Ur-S6 comes in Ragusa Green over an Ecru interior awash in leather and contrasting wood. One place where Audi has always excelled has been its interior design efforts, and this one looks just as inviting today as it did 16 years ago. Let’s see, I mentioned the five-speed. That’s attached on one end to a 2,226-cc, 20-valve five pot that with its turbo sidekick made 227-bhp out of the factory gates. On the other side of the gearbox lives Audi’s Torsen-imbued Quattro AWD system. The seller notes that the car comes with maintenance records going back to when it was new. That’s pretty impressive seeing as it’s had five owners (there’s that number again) over the course of its life and 155,000 ‘gingerly driven’ miles. Geez, does that mean all its owners were red heads? There’s been plenty of work done to the car to keep it on the road and its owners’ wallets lightened. A 1.8 coil pack upgrade is noted, as is a cat-back exhaust and a performance chip. Most all of the suspension has seen some attention, and the clutch was done at 78K. The paint is still shiny, and the V8-sourced basket weaves look good on the car. Inside, everything appears tidy and only an aftermarket boost gauge calls into question the decisions of those who have come before. Overall the car looks to be in great, but still ready to play shape. It doesn’t appear to be either a trailer queen or a fright pig. Instead it maintains that OCD Goldilocks middle of the road I-could-drive-that-and-not-worry-about-it position. There is a milage issue on the AutoCheck report, but that came a while ago so make of it what you will. Also make what you will of this car’s $8,400 price tag. That’s the asking, and the car is being offered both on Craigslist and eBay, where bidding is up to $2,175 and there are 31 watchers. We’ll just have to help them out by voting on whether this Audi is worth that $8,400. What do you think, does this S6 get an A+ for price? Or, is this an old executive express that’s just too expensive? eBay out of Spokane WA, or go here if the ad disappears.